Happy New Year from the HandyDART Riders’ Alliance! 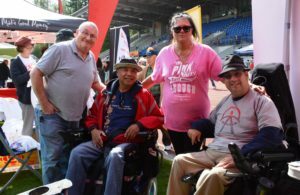 2016 was a momentous year for the HandyDART Riders’ Alliance, and 2017 is shaping up to be just as busy and important. We have achieved a lot, and with your help can achieve a lot more. The HRA has been working for years to get regular annual increases in HandyDART service. And now we have been promised increases in 2017, 2018 & 2019. This is much better than the situation since 2009, and sets the stage for further increases in future years. Before thinking about the year to come, it seems like time to take a look back. In 2008, the Provincial Liberals unveiled a grandiose pre-election transit plan. It had something for everyone, and a price tag of $14 billion dollars. The provincial Liberals were re-elected in 2009. And they quickly reneged on their transit promises and started cutting back on Transit service, including HandyDART. The growing population of seniors means the number of people with disabilities is increasing twice as fast as the rest of the population. And HandyDART service levels per capita have been declining since shortly after the 2009 election. HandyDART riders can’t even be sure who is making the decisions that affect our lives and human rights. 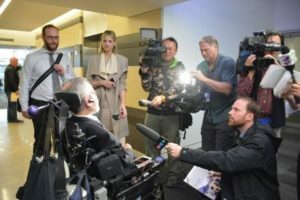 In March 2015, Frances Bula wrote in the Globe and Mail that according to “numerous politicians and TransLink employees, the agency’s executives and staff are on the phone to the Transportation Ministry in Victoria several times a week, getting clearance for everything from news releases to new equipment.” This kind of political micro-management is obviously dysfunctional, and must be very frustrating for TransLink staff. There will be a provincial election on May 9 2017, and we will ensure that this history is not forgotten. 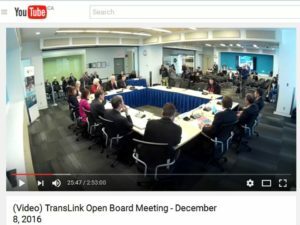 We appreciate the positive steps taken since Kevin Desmond became TransLink CEO in March 2016. But we won’t just wait and trust the process, because the process is still broken and the problems are too urgent to wait. We also know that some of the problems can only be fixed at the level of the provincial government. We were assured that $800,000 was going to increase HandyDART service in 2016, and that 90% of this would go to HandyDART buses. We want to see the numbers, and be sure that this actually happened. Only HandyDART buses driven by trained and dedicated professionals provide the kind of service many HandyDART riders need. HandyDART riders have been promised a 15% increase in HandyDART service in 2017-19. However, we have yet to see numbers that add up to a 15% increase in service. The devil is in the details, and we will be looking at the details very closely in 2017. We will also be campaigning for ongoing increases in service in 2020 and beyond. The need will keep increasing – the baby boomers are not getting younger. 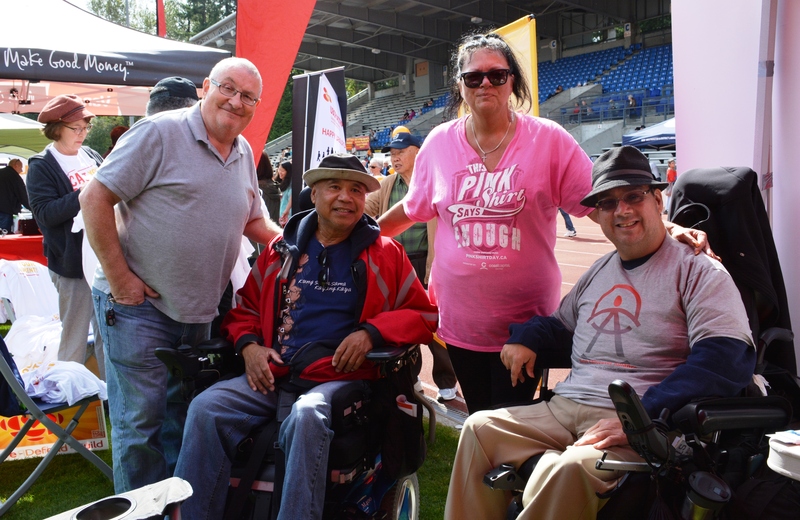 For quality HandyDART service that meets the needs of people with disabilities and older seniors, HandyDART must either be brought in-house as a TransLink subsidiary or turned over to a non-profit agency. 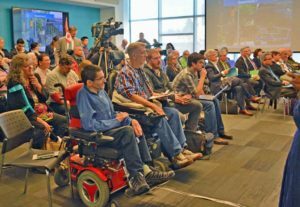 This question is being examined with input from the “Custom Transit Service Delivery Review Stakeholder Advisory Committee.” HandyDART Riders’ Alliance members Tim Louis and Patrick Maxcy are on the committee. It is a very good thing there is a process in place to look at bringing HandyDART in-house. But too many people who do not use HandyDART regularly are involved. We hope that this process will result in a positive outcome, but the choice of a multinational corporation as the consultant is not a good sign. We have not been lulled into complacency. And we need your help to make 2017 a good year for HandyDART riders! I live and my LIFE depends on my daily urgent medical treatments”. This morning HandyDART abandoned me and left me to find my own way to my urgent medical appointment, due to Vancouver’s East side road condition and ill equipped vehicle.Dispatch decided it was unsafe for me and all involved.My booked return trips were cancelled; both ways, on site and, was told I was on my own. I did find my way on a “TAXI”. I am saddened as to how the HandyDART drivers play this on site trip denial policy. 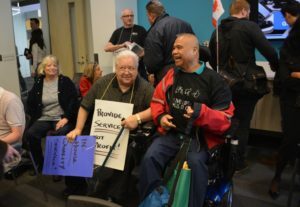 As an essential transportation service TRANSLINK need to review this punitive policy, there has to be a better alternative, many CITIZENS seniors and vulnerable residents depend on this service. Is taxi the better choice? I am a frequent user and it is only with my patience and flexibility that I get things to work. There are so many suggestions I have made to improve service and utilization and of course been ignored. It is indeed an antiquated system not using modern apps and computer applications. So we indeed need to be part of the solution,I would like to volunteer where I can.